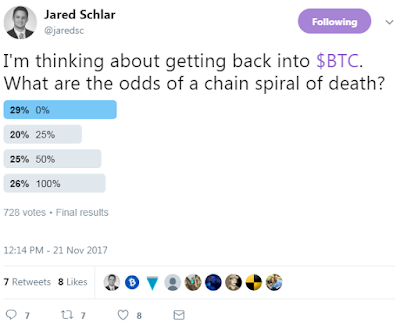 I'm conducting a Twitter poll right now regarding the Legacy Bitcoin odds of a chain spiral of death. Please complete the Twitter poll. It's free. Thank you! "I'm thinking about getting back into $BTC. What are the odds of a chain spiral of death?" The results are in and out of 728 votes, 29% of people said there was no likelihood of a chain spiral of death. Versus 71% said there is some odds of a chain spiral of death. View the image for exact details. Bitcoin Legacy - Severe network congestion. There are about 58MB in the pool right now for Bitcoin Legacy vs Bitcoin Cash which is .1MB. Bitcoin Legacy - Civil War with BCH and other contentious groups. There may be another fork coming in January. We shall see. This brings up a good point which is unless you are 100% confident in holding one coin, it’s best to diversify into multiple coins.